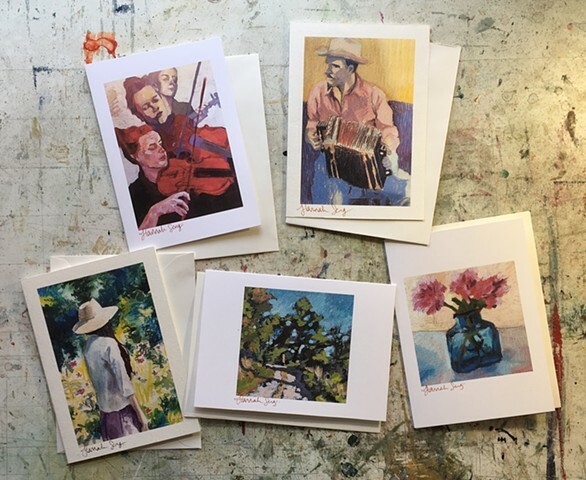 I am now selling cards through my website. 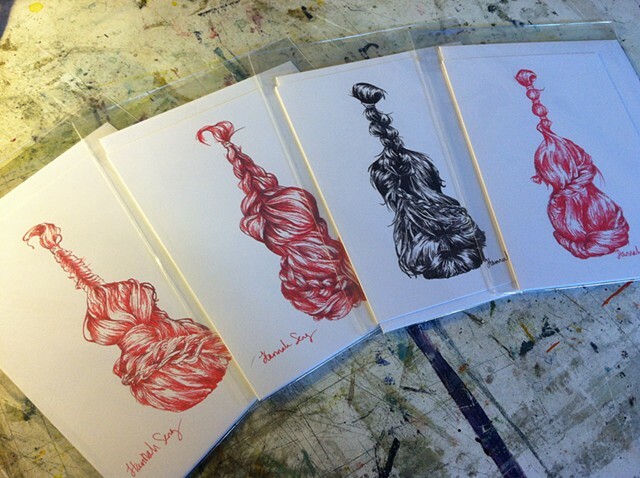 These cards are ordinarily $5 a piece, but I am selling them as sets of 5 for $20 online. Visit the Stationary page to see the selection of available artwork & select your set of 5 to purchase. 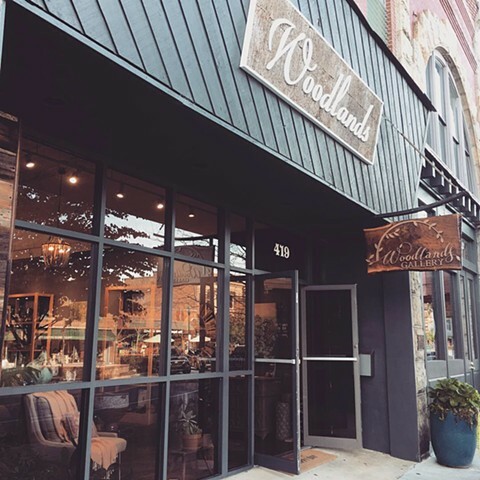 My work is now on display at Woodlands Gallery, located at 419 N Main St in downtown Hendersonville, NC. I'm so happy to be included in this selection of beautiful fine craft & art from the region. You can visit my Instagram page hannahsentart for updates on which works are headed there, & they'll also be listed here on my website. I'm looking forward to having a booth of my paintings for sale at the Little Mountain Festival this Saturday, October 13th, in Tryon, NC. The festival is hosted by potter Tyson Graham. There will be a kiln opening at 11am, live music, & other arts. Bring a picnic to enjoy on the lawn! Find more details at Tyson Graham Pottery & check out the article featured in this month's Bold Life Magazine. I'm happy to be showing all new paintings at the Purple Onion Cafe in Saluda this fall. You can see my work in person there among many more paintings from the many great talents the Saluda area has to offer. Included in the batch is this Rufous-sided Towhee, a common sighting here in the mountains & a familiar song to hear throughout the day outside my home studio. You can see the other new paintings under the PAINTING section of my website, but I recommend seeing them in person when you can! Beginning this Monday, June 4th, my paintings will be featured at the Purple Onion Cafe in Saluda, NC. Visit the cafe to see a selection of my latest work displayed together, & you can take one home with you! There will be a reception to celebrate the variety of painters local to the Saluda area on Wednesday, June 13th from 5:00 to 6:30pm. Wine & snacks will be available, & you'll get a chance to meet the artists & hear us talk about our work. The Purple Onion Cafe is located at 16 Main Street, Saluda NC, 28773. Visit www.purpleonionsaluda.com or call (828)749-1179 for more cafe information. 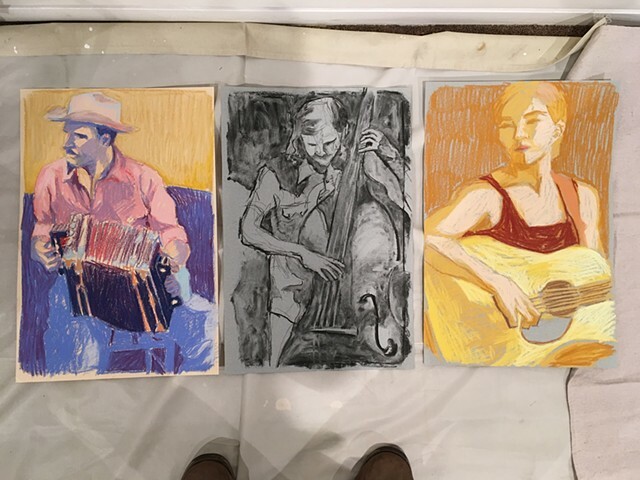 This past weekend the Upstairs Artspace in Tryon, NC, hosted two five-hour drawing marathons for a handful of artists to work on individual projects. The gallery provided a quiet work space for us to each spread out & let the creativity flow. We were specifically instructed to let this be a quiet session, so no chit chat. The best three pieces from each artist would be chosen to display, although that number felt daunting to some of us who felt like we'd be lucky to finish just one piece. We took a short lunch break & got to know each other a little. I brought my pastels & vine charcoal, some toned paper, & photographs of friends playing music to work from. There was no internet to get swept up in, no need to text or call anyone. Even my own studio can be distracting, with all its books, pictures, plethora of supplies & surfaces, &, of course, a cat. There were no windows to look out. A few little conversations flitted here & there, but for the most part it was just the sound of pencils & pens scratching paper. This is how I meditate. In the company of other artists working to materialize their own interior worlds of visions, the skin of insecurity & doubt begins to shed. The questions "What should I do?" & "Is what I am doing good enough?" dissipate with the pressure of just getting as much work done as I can before the clock has declared time is up. I often set myself up for too much work when I am in my own studio, thinking I have an entire day to come up with some new masterpiece. I get tangled up in worrying if it will sell, if it will be unique, & if it will satisfy my creative urges enough. With the limits of what materials I could use, what images I had to draw from, the space I was in, & the amount of time I had allowed me the freedom to explore without distraction. My mind became clear & determined, & even though we were keeping to ourselves through most of it, I felt camaraderie with these artists. We were in this thing called creativity together. There will be a reception to see all the drawings at Upstairs Artspace this Saturday, February 24th, from 6-7pm. You can find more information on their website: Upstairs Artspace. Video: "Kwangana" from fall 2014 performance. Filmed by Scott Kinard. Consider joing WACC yourself! Visit Suzannah's website to learn more about this opportunity to build & bridge community through singing. All the music is taught by ear, & there is no audition to get in. Mark your calendars for Saturday, November 18th, in Saluda, North Carolina. 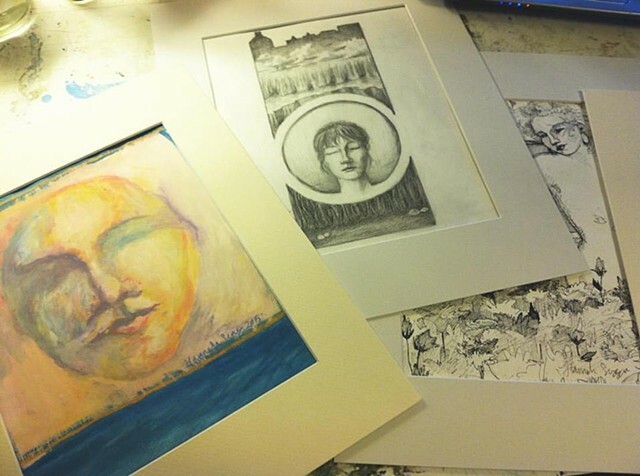 I will be selling some original artwork, reproductions, & stationary at the open studio event of potter Robin Kirby. Robin will be selling her latest pottery, including mugs, bowls, platters, & holiday-themed home goods. This is a great opportunity to collect quality handmade art from two artists local to Western North Carolina, whether to use in your own home or to give as gifts. You can view some of Robin's latest work here. Now that fiddle camp is over & there aren't any musical gigs lined up for another couple of months, I'm back at the painting desk. I've just begun working with new canvas sizes & formats, which are already determining how I approach my painting subject. It's a great way to break out of old habits, trying on new sizes. Because of framing costs & also not having the means to stretch my own canvases, I've grown accustomed to working with standard 8 x 10" or 18 x 24" canvases. This 4 x 12" gallery-depth canvas lets me get a little more creative with how I treat my subject matter, & I can paint around the edges to give it a finished look without framing it. I'd love to see how it looks in a frame, though. 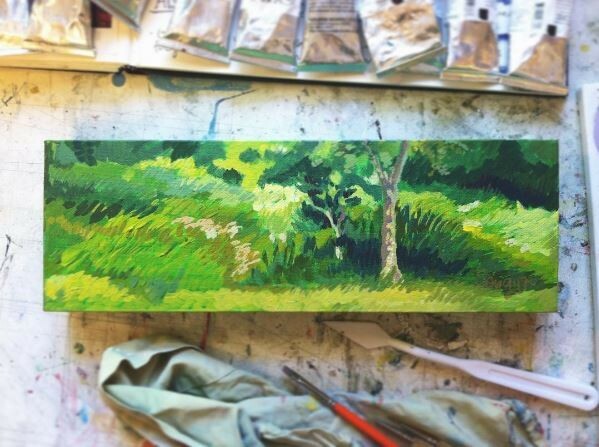 Keep an eye out for more small paintings from this summer series. I have booked at trip to Scotland for the end of August, 2017, & will be building material for a new series of paintings & drawings based on my experience when I return home. 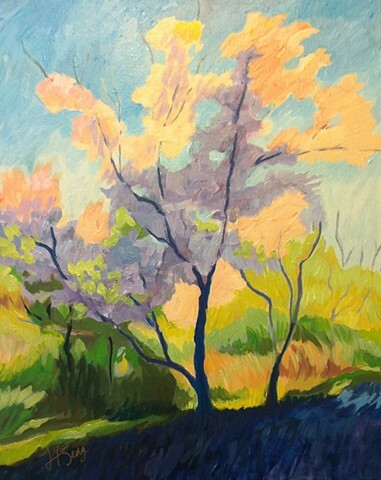 With a theme of "sense of place," I will be focusing on landscapes, plant & wildlife, & people in my new work. I am currently taking pre-orders for giclee prints of the artwork I will make, & you can pre-order yours now from my website. 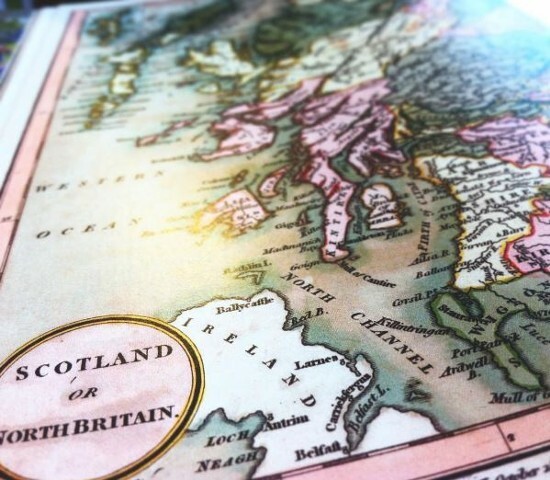 Visit the Summer 2017 in Scotland page in the Artwork for Sale section to learn more. In 2013 & 2014 I did a similar body of work based on two separate trips to Ireland. You can view those paintings in the September In Ireland Series section of Past Artwork on my site. The Saluda Arts Festival is happening this Saturday, May 20th, in downtown Saluda, North Carolina, & you can find me there! I'll have a booth next to the post office. Come visit me & see my work from 10am to 4pm. Because I will have most of my work for sale at the festival, I am closing my website & Etsy shop of sales. Please contact me at hannahseng86@gmail.com if you see something online that you want to purchase, & I will let you know if it is still available. Thanks! 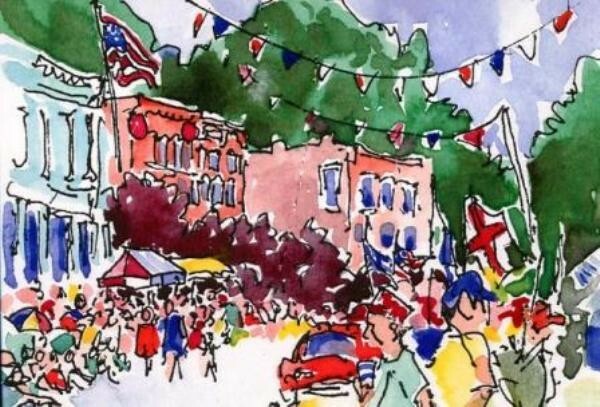 For more information about the Saluda Arts Festival, click here. May is here! Mark your calendar for Saturday the 20th for the 2017 Saluda Arts Festival, from 10-4. I'll have a booth of paintings among the many local artists spread over downtown Saluda. It's going to be a fine time! This is a reminder for an upcoming performance at sOlid studios, located at 144 Tunnel Road in Asheville. The studio entrance & parking are underneath Comic Envy, in the back of the building. Comic Envy is next to Black Dome Outfitters. I'll be performing a set of all original material, like this song I wrote in 2009 called "High On A Small Screen." This is an artist’s work space. We will do our best to make the space accommodating for all that attend, but please be respectful to the artist’s work & tools by looking only. 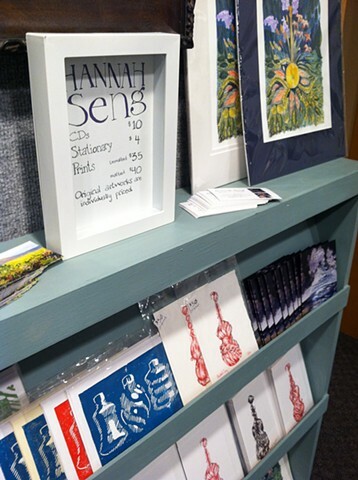 Hannah’s CD & original artwork will be available for sale. Seats may be limited, so we invite you to bring your own chair. Contact me at hannahseng86@gmail.com if you would like to reserve a seat, or if you have any further questions. Otherwise come in & sit where you like. Ireland is not mine, & so I don't have a place to romanticize its rolling landscapes & charming people. I want to understand it for what it is, hardships & victories & all, & then I want to understand what my own North America is. Watch & listen to these words from Stephen James Smith on this day that we celebrate the Patron Saint of Immigrants, Saint Patrick. Save the date for an intimate performance of song, banjo, & fiddle by Hannah Seng. 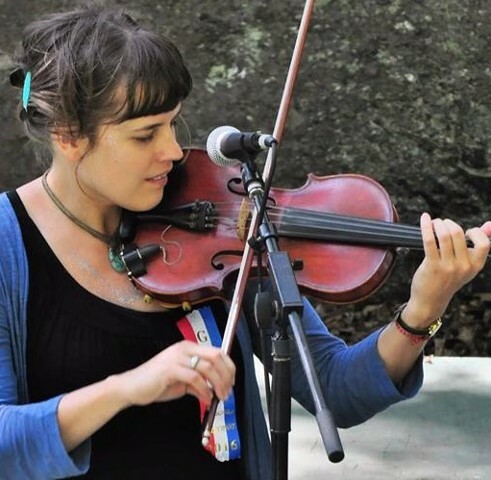 With a love for traditional Irish & Appalachian songs, Hannah has been crafting her own original music to explore a realm of old & new sounds. This event will be hosted by Molly Sawyer in sOlid studios, located at 144 Tunnel Road in Asheville. The studio entrance & parking are underneath Comic Envy, in the back of the building. Comic Envy is next to Black Dome Outfitters. Contact Hannah Seng at hannahseng86@gmail.com if you would like to reserve a seat, or if you have any further questions. Otherwise come in & sit where you like. We're being lead on by teasingly warm weather these days. I can only hope global warming will be a little sweeter to us this summer, & not put us in a deeper drought. We're planting ferns & mosses in our cool north-facing banks. I feel inspiration coming on for woodland creature illustrations, & these beautiful folks dressed in Nature's gowns tickle my fancy. Check out the beautiful images. They hint at something mythological. 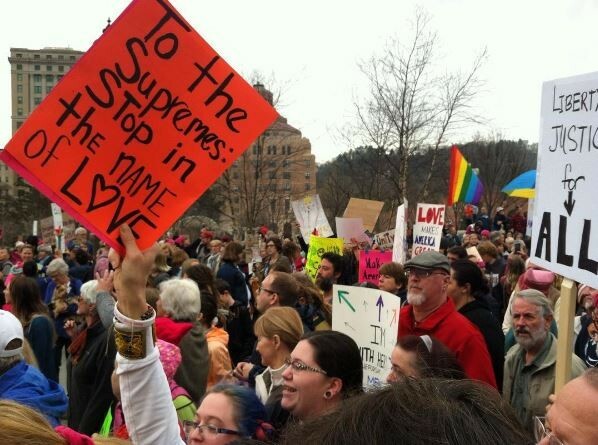 Asheville's own Women's March on Saturday, January 22nd, 2017. This is the first march I have participated in, & my heart is full to the brim. I am one among many of my friends & family that has been unhappy with this presidential election, but I often forget what a bubble I have lived in, here in Asheville, North Carolina. We connect over Facebook & through our lifestyle choices in the community, which adds to the illusion that all of this red state is actually blue. We are really more purple, I suppose. This world-wide march has truly lifted us up out of our grief. It has shown us that the circle of loving, compassionate, proactive communities may be small in this region, but we are not alone. I am so grateful for all those men, women, & children who have marched this weekend. We have come from many different places & for a number of reasons, but I will carry these images of solidarity in my heart forever. Here is a beautiful collection of marchers around the globe. It feels like seeing members of family I didn't know I have. If Mama Were A Moon - 2017, acrylic on paper, 12 x 10"
I was first introduced to Neil Gaiman's comics in high school through a girl who loved Lord of the Rings but hated Harry Potter. I felt it a conundrum to be on one side or the other of two remarkable pieces of literature like that, but then I grew to realize I love Harry Potter novels more than I love the Lord of the Rings trilogy, & I couldn't quite tell you why. I was happy that we could both agree on Gaiman's Sandman, though, & after she loaned me her comics I collected a couple volumes of my own. In college I referred to Gaiman's characters for inspiration in my own artwork, His novels fed my visual imagination as a source of intellectual fantasy & mythology. The juxtaposition of life's brutality & its softness drew me into his work, as did his method of bringing modern life on Earth into magical chaotic realms of fairies or mythical gods. Worlds that felt otherwise separated were now joined, a reminder that we're all in this together. While I developed my skills as an old-time fiddler & banjo player, I felt like I had to closet my love for Gaiman's work for a period of time, brandishing my plaid flannel & affinity for things rustic & basic because of stereotypes projected onto Appalachia & its old-time players. People who loved the work of Neil Gaiman seemed to also love the work of Tori Amos, & I didn't love the work of Tori Amos. I've come to realize that that's okay, though. That's fine! You can't stuff away who you are. That's not interesting. That's not authentic. How can you make authentic work & live a wholehearted life if you can't openly credit those who inspire you? Loving the work of Neil Gaiman & also that of an old-time fiddle player seems like loving two completely separate things, like having a conflict of interest. I held back one love or another from influencing my work & my music in fear that it would just make me a fraud at whatever I was trying to accomplish. I'm realizing it is perhaps my job as an artist to bridge the two influencing art forms. Lately I have listened to Neil Gaiman's audio books & interviews while I work in the studio, & his words are feeding my creativity like rain feeding a spring, nourishing growth all around. Of course, this doesn't exactly mean I'll be getting more work done. It's just feeling more true to my spirit. Or something. Here is the man of the hour! Winter is typically quiet & slow moving for many of us. It's a time to draw inward & reflect & hibernate or whatever it is you do. Maybe you move south & keep the party going. I'm working on some new paintings that remind some people of my Granny's work. She painted what my brother calls "Angry Flowers," meaning she could assault you with liberal use of color & brush stroke. I even think I look like her in this self-portrait. I don't mean to channel her, but my painting professor would say "there are no accidents." 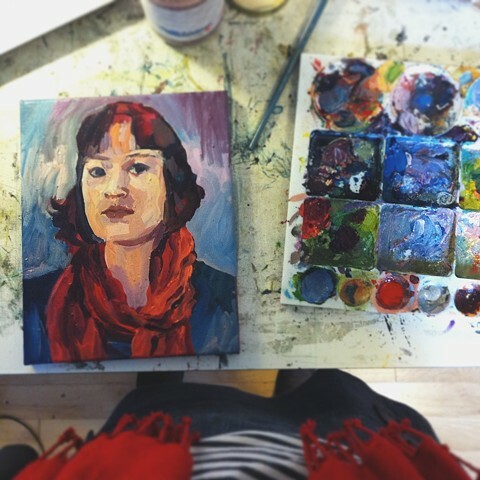 I can't keep up with the things I want to paint right now, & so January feels like it's not so quiet as it rushes by. I look forward to Mondays the most because they are the beginning of a string of days I get to work in the studio. When I start looking into my agenda for Tuesday I feel a little stressed that I'm already running out of time. This is kind funny, but I don't think it's a good sign. It feels like the scale of self-employment is tipped too far into one direction, the unknown of future projects & opportunities. But, I am reading that the artist must embrace uncertainty if she wants to keep moving forward. Art & Fear: Observations On the Perils (and Rewards) of Artmaking, by David Bayles & Ted Orland. Laghdú by Caoimhín Ó Raghallaigh and Dan Trueman. The snow came on Friday afternoon; first lightly, in flakes barely visible if you weren't looking closely, then in fat round flakes that fell heavily onto the ground. It stuck quickly, & so we took a walk into town before, where all was fairly quiet. Everyone had gone to the grocery store for the past two days, so they were tucked into their houses, safe & sound. There were no footprints yet. The pond was still perfectly green. It's unusually green, actually, as it stands out even in the summer. Summer in Saluda is densely green. Maybe it's the humidity that makes it feel dense. I was too excited to sleep when bedtime came. 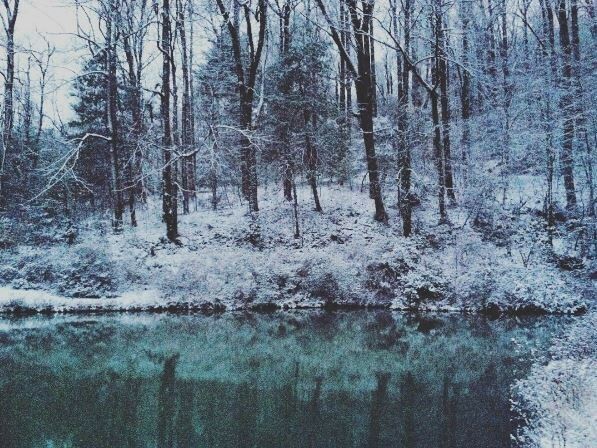 I felt like a child waiting for Christmas, knowing the snow was falling all through the night. The snow was light & fluffy when we first ventured into it on Saturday morning, after breakfast. Someone had plowed our driveway in the night, as the evidence was mysteriously evident in piles of snow & gravel on either side. It was difficult to pack the snow down to build a snow man, so we built a tall cone of the stuff, calling it our gargoyle, & named it Garfield. He watches over the town & protects us, & is accompanied by his small round cat-friend, Pyewacket. The sky was still clouded, but it was getting brighter as the winter storm was on its way out. We went inside, had tomato soup & grilled cheese sandwiches, threw our clothes in the dryer, then trudged back out into the snow. The sun was out then, so we wore our sunglasses. Sunlight reflecting off of the snow can be absolutely maddening if you don't wear sunglasses. You come into your dark warm house, & you realize you've been blinded. You can't make out the black cat curled up on the white couch, only swirling neon colors. The snow had melted a little bit on the way to the school, where neighborhood families & those with vehicles equipped well enough to venture out of the woods had gathered to sled. The sleds packed the snow down with each turn, making for slicker trails that gave the heart a rush when we slid down from the hill crest. We screamed & laughed, mouths full of powdery cold snow as we crashed into it at the foot of each hill. We scrambled to our feet & trekked up to the top of the hill to slide back down again & again. The snow exhausted us. Chili had been cooking in the crock-pot all afternoon, so the house welcomed us with a sweet & savory smell that wrapped around us upon reentry. And it was so warm. Oh, the house was so warm. The Kid's pants had soaked through, & she was freezing, but she still had a smile on her face. We were quick to change into our thick pajamas & bathrobes before snuggling under blankets on the couch to watch a movie. When was exhausted from sledding in the early afternoon, there's nothing to be done until supper time except watching movies or reading books, maybe even napping. When the movie was down we filled our bowls with the chili, accompanied by biscuits, & a beer for the grownups to wash it all down. Then we crawled into bed & slept hard. I'm sure I snored. I dreamed a lot. The snow that had melted froze again over night, & now the roads are covered in six inches of ice. The sun is out again, without any clouds to keep it company, but it doesn't need them anyway. The temperature still won't rise above freezing, so there probably won't be any school tomorrow. The snow is waiting for us to come sledding again today. Poinsett Bridge 1, 2008. Photograph Courtesy of Walter Arnold Photography. Perhaps the oldest surviving bridge in South Carolina, built in 1820, this bridge is just down the road from my house. 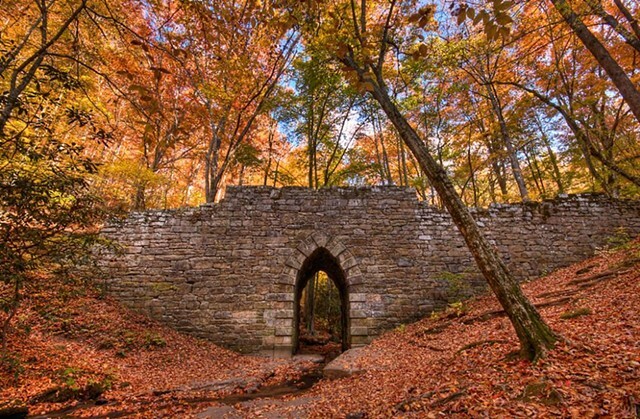 But I'm not here to talk about beautiful old stone bridges just yet. If you're curious about it, click here. As the holidays are wrapping up I'm turning my focus back to my transition from my home in Asheville to my home in Saluda. I'm still in the mountains, still in North Carolina, but now I am looking beyond the growing city life back into what I consider "home." I'm originally from a small town in the high mountains of Banner Elk, & lived also in Boone, Valle Crucis, & Morganton before moving to Asheville at the ripe old age of ten. With family & friends to visit in Boone & Banner Elk, we spent a lot of time going back to hike, camp, & swim, so I consider myself having grown up in those areas until I was a teenager. Once I had a car & driver's license, I spent time exploring these places of my childhood on my own or with my parents, finding nature a great source of inspiration for my artwork & music. The mountain air is different from the valley. The vegetation gets shorter as the roads climb higher. My memories are of thickets of rhododendron & grassy balds on the Blue Ridge Parkway & in the Linville Gorge. 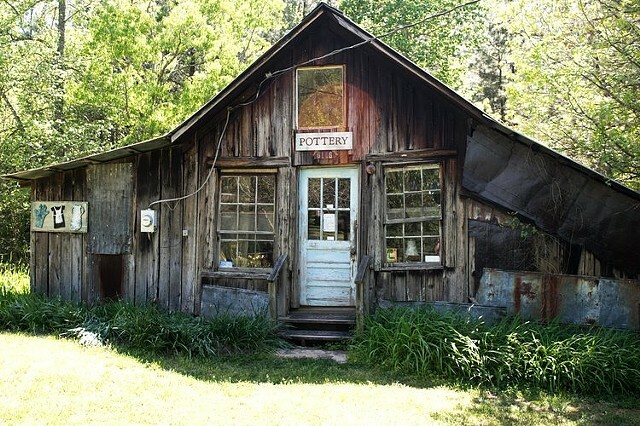 Saluda brings me back to complete the circle of living in a small town in the mountains, where I am still connected to the Asheville vibe, as it's called, through music, art & dance. 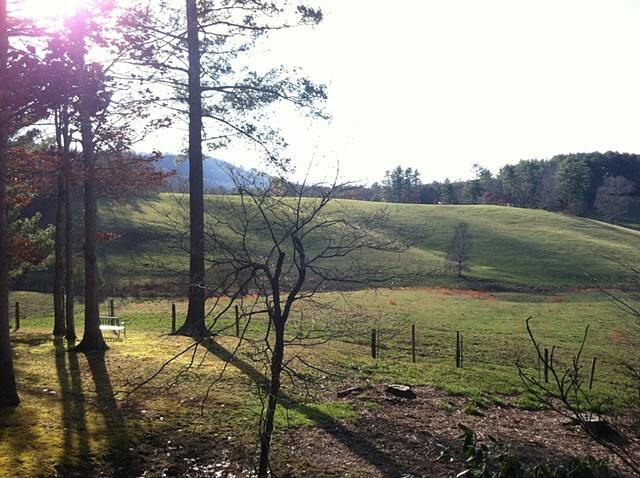 In looking around Saluda & other regions of the North Carolina mountains, I wonder why it is the landscape I am most fond of. It never ceases to fascinate me. Each time of year has its remarkable light, whether it's in the damp cold fog, the crisp autumn sun, or the thick haze after a summer thunderstorm. This whether determines what plants grow here & what animals move through the area. All four seasons bring a variety of sights, smells, & treasures. This goes for the people as well. I recently came across a painter, Kay Walkingstick, of Cherokee decent, a Native American people that once thrived in this area. 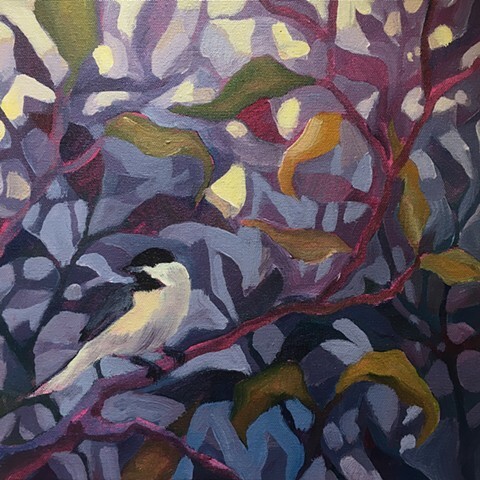 In her paintings, Kay explores the metaphor in a landscape, & what a landscape can convey of the people that inhabited it throughout history. This notion that a landscape is not a basic gaze upon an object, but a view of stereotypes, archetypes, sociology, anthropology, & whatever you might add, leads me to examine what is inherited by newcomers moving to those places from somewhere outside, & how that heritage is strengthened, contributed to, or lost. What am I inheriting of Saluda's past that I now have to understand before integrating into the community? What am I bringing to Saluda from Banner Elk, Boone, Valle Crucis, Morganton, & Asheville? In recent years I have felt this question rise each time that I visited Ireland or attended musical sessions, festivals, & dances celebrating Irish, Scottish, & English culture: What am I bringing from Southern Appalachia to these places where my ancestors have come from? Christian (how interesting that this is said with a negative connotation). That we're a bunch of "rednecks" & "hillbillies" who only eat fried food & drink cheap beer on our dilapidated trailer porches while holding our shotguns & yelling at our pit bulls chained to trees in the yard filled with rusted cars & trash. These people exist everywhere, not just the South, & the South is not at fault for violence & hatred in our country. I want to explore why we are drawn to stereotyping others. I want to look at what it means to be "educated," & why the uneducated people are the ones voting against themselves when they elect their power-hungry leaders. What do we need to know to move forward as a community? I think one place to start is knowing the history of the land. Who was here first? Who moved through it over time? What were the religious & spiritual beliefs of those people? Who were people running from? What was happening in other parts of the country & the world at the time? How can people learn empathy & compassion from history? I want to explore significant landmarks in the South, in North Carolina, & in the Blue Ridge Mountains through my paintings. I want to deepen what I know of all that led to the settlement of these places as I paint them, who inhabits them today, & to look at the role of migration in the development or destruction of the communities. A perfect endeavor for heading into the New Year. I'm preparing sketchbook drawings with mats & backing to be listed on my website, & also to display in coming shows. These are the drawings that get buried in pages of doodles & experiments, but I really feel proud of them. They're heartfelt, & it was perhaps an accident that they ended up in a sketchbook & not a canvas or something. I didn't think sketchbook pages were worthy of leaving those bound pages & moving into frames. I also was perhaps a little shy about sharing them, maybe because I didn't feel like I could explain them at the time. I feel more & more certain, however, that nothing ever comes "out of the blue," & that has caused me to really re-examine these pieces & how they are uniquely my own. I'm feeling inspired to keep pushing the ideas & methods behind them to make new pieces. This process of taking them out of my sketchbooks & giving them mats is curiously a lesson in both not being attached to them & also honoring them with respect. 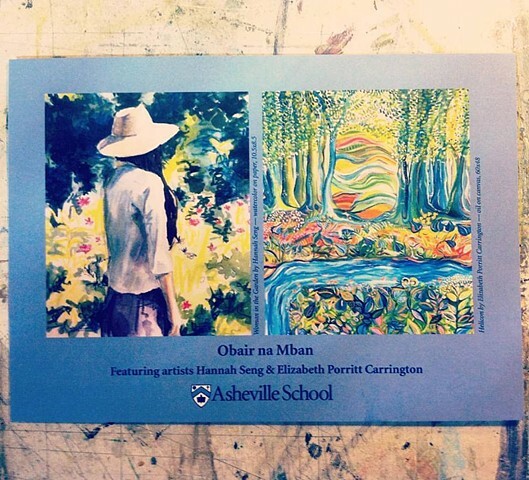 The exhibit Obair na mBan is still showing at the Asheville School until December 15th, but we're having a closing reception today, alongside the Asheville School Holiday Art Sale. For TODAY ONLY I'll have a selection of prints, stationary, & CDs available at the exhibit as part of the Holiday Art Sale, as well as a few new original pieces. Obair na mBan ehibition runs through Thursday, December 15th. 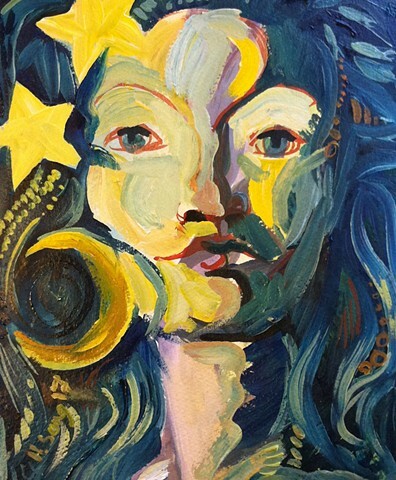 Closing reception & Holiday Art Sale: Thursday, December 8th, 4-8pm. If you're coming from downtown, stay on Patton Ave (about 4 or 5 miles after you get off I-240) until you see the Goodwill & DMV on your left. The Asheville School entrance is just after the DMV, on the left. Coming from I-40West, take exit 44 for Enka, & turn left onto Patton Ave/19/23-N. Go about a mile, following signs to the Asheville School, & it will be on your right. Follow the Asheville School Road, keeping right to follow signs to Mitchell Hall/Main Campus. You'll come around a curve to the right, getting a lovely view of Mount Pisgah, & passing a few buildings until you see Mitchell Hall on your right. Park anywhere you can along the road, & look for Art Gallery signs pointing towards the Perkins-Raymond Building, between Mitchell & Lawrence Halls. Follow the stairs to the front entrance in the center of the building, & head down the spiral stairs to the Crawford Gallery, & you'll see us! 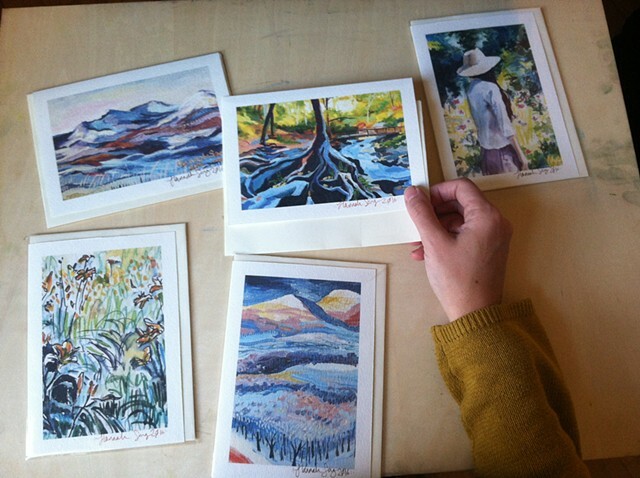 I've added a set of four printed cards for you. They're each folded & blank inside, & come with a blank white envelope. Check them out under the "Stationary" page in PRINTS, or click here. These drawings came out of a desire to connect my artwork to the fiddle, an instrument I began playing at the age of thirteen. I had already drawn one or two fiddles, filled them with watercolors, & was quickly uninterested in recreating the same detailed image over & over. At the time I was studying the work of illustrator Teagan White, & I remembered seeing her braided typography, so I thought to test out making a fiddle of braids. The braid proved to be more difficult to draw than I had anticipated, however, & I had to work a few out in my sketchbook before I felt ready to commit one to a fiddle. When the fiddle was drawn, I liked it enough. Still, I knew I could do better, so I drew a second one. That one came out alright, too, but. I started looking up braids on Pinterest. What a rabbit hole that became. Each image of a woman fanning her hair out, turning her head so only her profile was visible, or maybe a sliver of her cheek peeking from behind her tangle of flowing braids & folds of pinned hair put me in deeper touch with how I see myself as a women. What fun it then became to explore a multitude of braids & bridal up-dos & turn them into fiddles. I added flowers & let the salty wind of the sea give them rough curls. I'd love to move on to a series of "portraits," putting into fiddles the braided & pinned hair of my friends & family, & give them more personal names than "Hairy Fiddle 3," like "Orlean" or "Eleanor's Revenge." While I work in my studio, I am usually tuned in to a favorite album playing ad nauseam, or maybe a live or archived radio program. Lately, however, I've been listening to these authors talk about their philosophies & research on the creative process. Their words have been inspiring & motivational for my own work, so I hope you can find something for yourself in them, too. Elizabeth & I are very proud of ourselves & each other to have so much work for our show finished & hung, ready for this evening's opening reception. This exhibit has pushed me to create as much work as I possibly could while moving to a new town & thus a new studio, performing musical gigs, teaching music lessons, & also helping my parents move into a new home. I hope you can come visit us during the reception, & get to know us a little better in the presence of our work, but please stop by the gallery any time until the show comes down on December 15th. Obair na mBan exhibit opening reception: Wednesday, October 26th, from 6:30 to 8:30pm, with refreshments & live music. Show runs until December 15th. Even though I moved into a new home & studio this month, I feel I've made incredible progress working towards this show. Elizabeth & I both are in the final push to get everything framed & labeled. I've created a new gallery on my webpage for you to see some of the images of works in progress, as well as images of Elizabeth & I, & the landscapes we're both so inspired by. The hanging of the artwork hardly feels like an end to this series. Rather, I feel like we've just opened ourselves up to an entirely new & higher level of creative collaboration, & we're already scheming about where we can take our art next. It's a delight to know this art exhibit has pushed me to focus on my painting as it has. 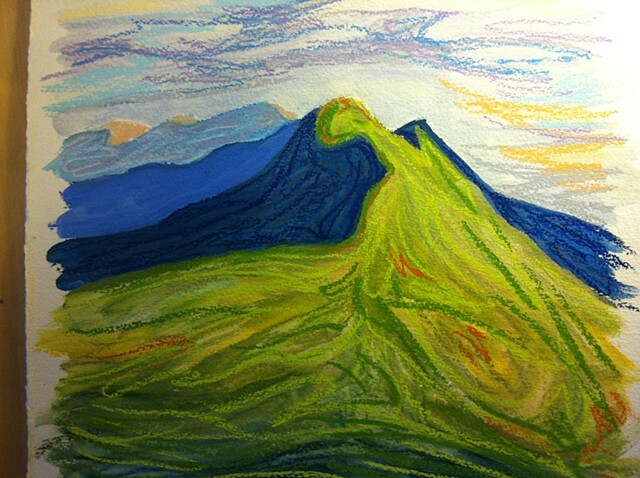 Pronouced "OBB-er na MON," this exhibition celebrates the creativity of two women, Hannah Seng (western North Carolina) & Elizabeth Porritt Carrington (Ireland). "Seng and Porritt Carrington were first connected by their longing & love of Ireland. They swiftly discovered their connection was more deeply rooted in the practice & process of painting. Both artists are compelled to work directly from nature, drawing meaning & replenishment from time spent outdoors. They carry that inspiration into their studios to be unfolded in color, line, & imagination, expressing their belonging to that most ancient capacity, of Artist." The artists will attend the opening, which will be in Asheville School's John M. Crawford Gallery on Wednesday, October 26 from 6:30 p.m. to 8:30 p.m. The evening will also feature live music: Hannah Seng will play original and traditional songs of Appalachia and the British Isles. The event is free and open to the public, and light hors d'oeuvres will be served. I've pulled everything off my Etsy shop & closed the door. It was a good run, & helped bring my art to people here & there, but now I am ready to direct viewers to one location for purchasing artwork. 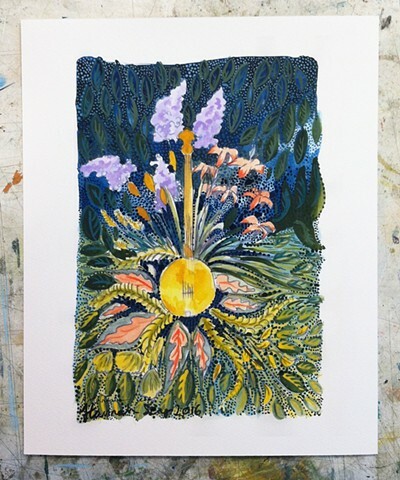 Visit the PRINTS section of my website for a few selections, including "Banjo Flora' & "Fiddle Flora," two pieces inspired by the wild abundance of music & gardening in my life. CDs as well! Under MUSIC you'll find a link to my CD I recording in the fall of 2015, with a track listing & a short description of the music. The page includes a link to my BandCamp page, where you can purchase the digital download of the album.